If you recently have bought latest IPHONE 5s then certainly today’s gift would be extremely useful for you . Wondershare presents Wondershare Video Converter Pro original worth $39.95 per license key for free . Wondershare Video Converter Pro will convert videos to compatible for your IPHONE 5s . And it has lots of awesome and worthwhile features for Windows(computer/laptop) users . Wondershare Video Converter Pro has really easy to use and user friendly interface . Everyone easily can convert desired video into most used and popular video formats . Apart simple video conversion , as well as you can convert HD and even camcorder AVCHD video to your favorite video and audio formats . And the best thing is that you also get 3D conversion ability in it . And if you want to extract audio from a video then it allows you to easily extract audio from a video and save them in various audio formats . It has tons of preset and optimized profiles (preset settings) to make the conversion process easier . These preset profiles or settings perfectly gets fit for your multimedia device and smartphone such as Windows Phone 7, Android phones, video game consoles etc . Therefore you don’t need to be an expert . Wondershare Video Converter Pro supports a huge list of input and output audio and video formats . You will never face any compatibility issues . Here is the list of its supported input and output formats . So respectable now a bit about its features for Windows users , It has many worthwhile features for Windows users . The very best thing is that now never need to use internet download manager to download your favorite video from any video sharing websites such as YouTube , Vimeo , DailyMotion etc . You can easily download videos without internet download manager . Wondershare Video Converter Pro also has a built in video editor to personalize and decorate as per your imagination and wish . Though it is a basic kind of video editor but fully equipped with all necessary video editing tools like merge, crop, clip, add special effects, watermark and add subtitles etc . And you also can capture or extract an image from any video and can save them in JPEG or BMP image formats . If your Windows media player is not able to play your desired video then it has a solution for this problem . It comes with a media player with almost all audio and video codecs . You can visit the Homepage to get full list of its features and abilities . 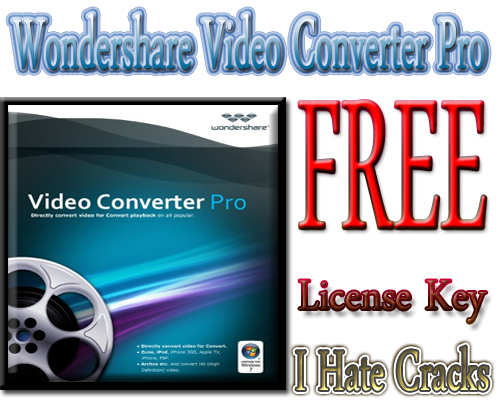 Wondershare Video Converter Pro normally available priced at $39.95 per license key but luckily everyone can grab it with a legal license key for free till 28 September 2013 . Visit the Giveaway page and share it on Facebook , Twitter etc to unlock giveaway . After doing so , submit your name and email address and click ” Get Keycode ” to get a license key for free in your mailbox .